Our Award Winning Family Software, Children’s Educational Software & Games! FAMILY SOFTWARE has sixteen applications and games that you can use at home. There are applications to help your kids with homework, applications to help with household tasks and fun games to play. These programs and games include a Dual-Mode Stopwatch, Consumer Loan Assistant, Flash Card Math Quiz, Multiple Choice Exam, Blackjack Card Game, Weight Monitor, Home Inventory Manager, Snowball Toss Game, Safecracker Game, Tic-Tac-Toe Game, Match Game, Pizza Delivery Simulation Game, and a Moon Landing Game. These applications and games became the inspiration for our award-winning computer programming tutorials. TODDLER FUN has ten fun exercises for very young children (ages 2-5). Each exercise has many options to enhance the learning process and only requires the ability to point and click the mouse. TODDLER FUN includes the following 10 fun mini-apps: LETTERS, NUMBERS, COLORS, SHAPES, ANIMALS, SOUNDS, PEEK-A-BOO, DOODLE, MUSIC and PUZZLES for your Toddler to learn from and enjoy. KID’S TYPING TUTOR will help you learn keyboarding, or typing (as it was called when typewriters were the major method of putting words on paper). You can learn about the keyboard and which finger presses which key. Practice with keyboard drills, character drills, and word drills. Take timed tests to determine and improve your typing speed. SCIENCE FAIR presents ten real-world applications of physics and math! For kids aged 9 to 17. The applications are: LEVERS, PENDULUM, WATER WHEEL, MOON LANDER, WEATHER WATCH, CIRCUITS, ROBOTICS, TRAJECTORIES, ROCKETRY, and PROBABILITY. PRIMARY LEARNING presents fifteen educational exercises for children aged 6 through 14. Numerous options allow for many variations in using the programs. The applications are: BALLOON MAN, SPACE RACE, HIGHER MATH, HIGHER MATH, MATH RACE, PIZZA PLACE, LEMONADE STAND, CANDY DRIVE, STOP THIEF!, GRAPHS & CHARTS, CALENDAR, KEYBOARDING, KID CARDS, US GEOGRAPHY, US PRESIDENTS and WORLD GEOGRAPHY. SPELLING GAMES – you can play ten different spelling games using lists of words you input or any of the built-in lists of 1400 words (Grade Levels K-6). Word lists (up to 30 words each) can be printed and saved on disk for future use. The program has an excellent LIST EDITOR for easy entry and modification of words. The games are: LIST REVIEW, TYPEWRITER, SPELLING BEE, SCRAMBLED WORD, WORD WORM, ALIEN RETURN, WORD ORDER, FIND A WORD, and CROSS WORDS. 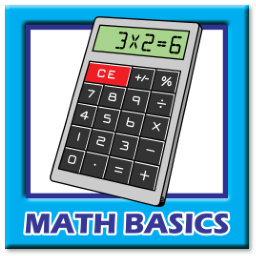 MATH BASICS consists of fifteen applications aimed at Grades 1 through 6. The programs help teach the four basic arithmetic operations of addition, subtraction, multiplication, and division for whole numbers, fractions, and decimals. The programs are: MATH FACTS, FLASH CARD MATH, MATH SLALOM, MISSING NUMBERS, ROCKETMAN, ADDITION, SUBTRACTION, MULTIPLICATION, WORD PROBLEMS, FRACTIONS, FRACTION MATH, DECIMALS, PERCENTS, and BASIC PROBABILITY. LOGIC GAMES provides fifteen applications that challenge a child’s thinking skills. The programs are aimed at Grades K through 8, but can be enjoyed by all. 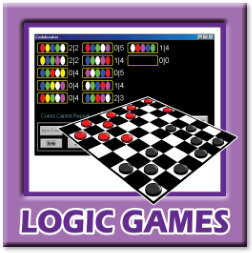 Each program in LOGIC GAMES has a number of playing options to provide a large variety of game situations. The applications include: CONCENTRATION, SIMON SAYS, CODEBREAKER, BUILD A WALL, JELLY BEANS, AWARI, DROP FOUR, ROW OF FIVE, REVERSE, CHECKERS, SLIDER PUZZLE, TWISTER PUZZLE, STAR PUZZLE, PEG PUZZLE, and ACEY DEUCEY. Awards For Our Children’s Educational Software! “My two year old is already enjoying EARLY LEARNING immensely and it is such a wonderful teaching tool. ” – CM, Karnak, Illinois. “Congratulations on really interesting software [EARLY LEARNING]!” – CF, Surrey, England. “My wife is a Kindergarten teacher and is very impressed with EARLY LEARNING. She especially likes its straightforward teaching approach.” – BB, Orland, California. “Your program [EARLY LEARNING] is great! Thanks! ” – MC, Austin, Texas. “I have been looking for a good educational program for my granddaughter for a long time. This program [EARLY LEARNING] is exactly what I want.” – MB, Virginia Beach, Virginia. “My 3 year old daughter loves the matching and ABC parts of this program [EARLY LEARNING].” – JE, Anniston, Alabama. “The children love it [EARLY LEARNING] and I do too!” – KK, Bainbridge, Ohio. “My kids are having a very enjoyable and fruitful time when using your [EARLY LEARNING] programs.” – KA, Madinah, Saudi Arabia. “Our three year old can’t stop playing your EARLY LEARNING games.” – BA and MM, Chicago, Illinois. “I don’t think I’ve ever come across such a comprehensive piece of educational software [PRIMARY LEARNING]. I particularly like the fact that the product can grow with my child.” – TC, County Carlow, Ireland. “Many thanks – PRIMARY LEARNING is a great program and I have been really pleased with it. ” – DM, Jerusalem, Israel. “I wanted to thank you for developing such a helpful program [Keyboarding in PRIMARY LEARNING]. I’ve looked at a variety of tutorials for my 55 year-old mom and yours is the best. ” – SS, Arlington, Virginia. “Your little keyboarding program in PRIMARY LEARNING seems simple and helpful. The Mavis Bacon program was given to me and I just can’t get into it. ” – BW, Seattle, Washington. “We love your software! How innovative, fun and creative! We’ve looked at over 25 programs and yours [PRIMARY LEARNING] is the best. ” – LV, Lincoln, Nebraska. “PRIMARY LEARNING is great! We appreciate finding learning software that doesn’t fill up our hard drives.” – JJ, Vancouver, Washington. “My daughter loves Stop the Thief! [PRIMARY LEARNING]. It really teaches logical thinking.” – MD, Edgewater, Maryland. “PRIMARY LEARNING is well done and will be used in the teaching of my grandchildren who are being home schooled.” – CH, Carlton, Georgia. “We love this program [PRIMARY LEARNING] – most fun we’ve seen. My 9 year old can’t decide between it and Nintendo.” – RL, Plano, Texas. “I, as well as my nine year old, really enjoy these programs [PRIMARY LEARNING]. Keep up the good work!” – FS, Desert Hot Springs, California. “I especially like the US Presidents and US Geography [PRIMARY LEARNING] games!! Good job!” – CW, Denison, Texas. “I really like the programs in math [PRIMARY LEARNING], my teaching subject.” – GM, Hanford, California. “My son absolutely loves this program [SPELLING GAMES] and it makes life so much easier when it comes to studying for test. I will definitely continue to spread the word about your wonderful learning software.” – LL, Chicago, Illinois. “Before we tried your game [SPELLING GAMES], our son was getting C’s and D’s on his spelling tests. After one week with your game, he was able to improve his score to an A and has gotten 4 more A’s since. He actually enjoys studying spelling now!” – LD, Athens, Ohio. “Thanks for creating such neat games and activities for spelling practice. My second graders are going to love it!” – SJ, Centerville, Ohio. “SPELLING GAMES has made learning the words fun for my son and much less stressful. I have recommended your software to all of my friends.” – SP, Yakima, Washington. “I am a homeschooling mother and my boys think it’s great that they are able to play that [SPELLING GAMES] as part of their school work! It has really helped them with their spelling words!” – TR, Edmond, Oklahoma. “We love SPELLING GAMES! I bought this for my 5th grader and am amazed that my 4-year old loves it too!” – TS, New Braunfels, Texas. “My son loves your SPELLING GAMES – the multisensory aspect, combined with the microphone and memory games makes it a game that provides benefits on many levels.” – SB, Saline, Michigan. “My homeschooled son learned to spell with SPELLING GAMES. He loved it. Now our daughter aged 10 uses it. ” – DN, Austin, Minnesota. “My son really enjoys using SPELLING GAMES and I like the fact that I can adjust the spelling words to our needs. ” – DW, Elizabethtown, Pennsylvania. “This [SPELLING GAMES] is an absolutely brilliant program! ” – BR, Hastings, Victoria, Australia. “My daughter has improved her spelling grade at least 30% because she enjoys playing these games [SPELLING GAMES] so much! ” – KT, Rochester, New York. “My sons use the program [SPELLING GAMES] all the time and they consistently get 100% on their tests! ” – TP, Thorp, Wisconsin. “My kids just love SPELLING GAMES and I loved the fact that within 10 minutes I had input their individual spelling words and they were playing the games. ” – TB, Parma, Idaho. “I firmly believe SPELLING GAMES is the solution for teaching spelling and vocabulary to those learning English as a second language. ” – BD, Beer Sheva, Israel. “Our daughter got A’s on all her spelling tests last year. And, your SPELLING GAMES program is the reason why! ” – WQ, Slidell, Louisiana. “I just love your programs. We home school and SPELLING GAMES has really put some excitement into our schedule. Thanks again! ” – SD, Barnhill, Illinois. “My kids love SPELLING GAMES. They fight to see who gets to do their spelling first. Thank you for such a wonderful program! ” – RH, Spanaway, Washington. “My kids really like this program [SPELLING GAMES] and it gives them a fun way to learn how to spell. ” – RT, Mountlake Terrace, Washington. “We have implemented SPELLING GAMES into our homeschool program and we love it.” – CW, Greenville, South Carolina. “I love this software [SPELLING GAMES]!” – AB, Fort Sill, Oklahoma. “We use SPELLING GAMES every week with our 4th grade daughter. I’m happy we purchased it. ” – PJ, Carson City, Nevada. “Thanks for a great program [SPELLING GAMES]! ” – DM, Arcanum, Ohio. “My nine year old loves SPELLING GAMES. Spelling is fun for her. ” – JW, Huntsville, Alabama. “Your SPELLING GAMES is without a doubt the best I have seen. My grandchildren will enjoy it for many hours.” – JS, San Francisco, California. “Great software [SPELLING GAMES]! As home schoolers, we find it very useful. ” – TZ, Traverse City, Michigan. “Great program [SPELLING GAMES] – it does the job perfectly.” – TT, Pasco, Washington. “Great program [SPELLING GAMES] for schools.” – HO, Covina, California. “What a great program [MATH BASICS]! – ED, Cleveland, Ohio. “Thank you for MATH BASICS. My daughter has had trouble with her times tables, but now she is on the computer every night studying – more fun than her books! ” – PG, New Brunswick, Canada. “My wife and I are elementary school teachers. We think this software [MATH BASICS] is great! ” – UC, Fort Worth, Texas. “We are enjoying your product [MATH BASICS] very much. It is exactly what I was looking for and a great price too!” – SC, Calistoga, California. “I love your MATH BASICS program – it is helping me study for my GED. ” – TC, Pampa, Texas. “Both my daughters, age 5 and 7, enjoy it [MATH BASICS] very much and love the challenge. ” – AW, Abilene, Texas. “I love this software [MATH BASICS] and will be recommending it to my friends! ” – CF, Milford, Delaware. “This is exactly the type program I wanted [MATH BASICS] – real learning.” – BS, Spring Grove, Pennsylvania. “I have downloaded hundreds of math programs – your MATH BASICS is the best.” – NR, Davis, California. “My wife and I are elementary school teachers. We think this software [SCIENCE FAIR] is great! ” – UC, Fort Worth, Texas. 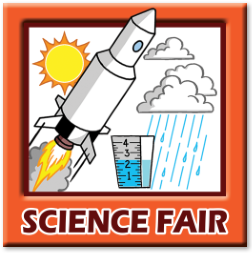 “I love this software [SCIENCE FAIR] and will be recommending it to my friends! ” – CF, Milford, Delaware.